Rev. 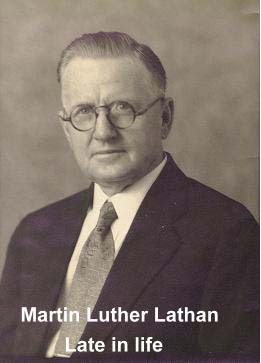 Martin Luther Lathan was first a minister in the Methodist Church and then in the Presbyterian Church. (click image for large version) He pastored churches throughout the nation, but mostly in the west and mid-west, including Oklahoma, Texas, Colorado and Tennessee. He preached the gospel his entire adult life. After retiring due to bad health, and shortly before his death, he wanted to return to active ministry and had an application on file with the Presbytery to be a missionary. He was know in the communities he served for his command of Latin, Greek and Hebrew. From time to time he was called on by members of the Jewish community with limited knowledge of Hebrew to translate letters from their family members who did not speak/write English. Due to the events in Europe and Palestine during the period of time from the early 1930s through the late 1940s his skill and sense of discretion about such services was appreciated. It was noted in his retirement biography, recorded by the Presbyterian church, that he enjoyed being able to furnish such a service to the community. More extensive biographical material is available by request. Copies of his records are available from the Presbyterian Church headquarters or by contacting the owner of this web site, William C. Lathan, Jr. Email. These records include exact dates of his calls to various churches throughout the nation. Although my Grandfather Martin Luther Lathan, baptized me while I was an infant ( a Presbyterian tradition ), he died while I was still too young to know him. I wish I had been able to know him. The following story tells you why. Note: What follows is a personal story about Rev. Martin Luther Lathan's legacy. In, 1971, I was a student at Carson-Newman College in Jefferson City, Tennessee. I had a girlfriend who lived out of town. She would, from time to time, come up to Carson-Newman to visit me and stay in one of the women's dorms. At that time she didn't drive, so I offered to teach her. This was a very bad idea as I'm a very nervous driver-education teacher. During one practice session of a Sunday afternoon we choose to drive on a road that was skinny and winding. After a little while she became tired and informed me she wanted to quit for the day. Due to the nature of the road there was no easy and safe place to pull off and change drivers for quite some time and she became more and more nervous. Finally a service station appeared around a bend in the road. You remember service stations, they were gas stations with a small garage for repairs. I said she should slow down to about 5 mph and try to pull up in line with the pumps. As she pulled off the road, I and she realized that she was still going to fast to make the turn safely. She didn't make the turn as planned. She hit the first pump! It fell over dead spilling glass and metal parts across the driveway. The car, my pride and joy, had a few minor scratches but no real serious damage. However, the pump was VERY dead. Interestingly, no gas came out. I checked all the doors and windows of the station but it was closed. I went to a home nearby to see if the owner knew how I could report the damage. He said that he thought a church, maybe the Presbyterian Church in Dandridge TN., owned the property. At the time, that seemed strange but possible. The gentleman gave me the name of a church member member he knew and a telephone number. I left my name and address and went on. On Monday, the next day I called the church member who's number the guy had given to me. Right off this man said that the station was no longer open as a service station. He told me the church had bought the property and used it as a youth activity center. He told me to not worry about pump. He went on to tell me the the power to the pumps had been shut off for a long time, the storage tanks had been drained and that the county had been after them to remove the pumps but that he would pass my concerns along to the Session of the Church, they were to meet the next evening. A couple of days later I received a note in my school mail box telling me to call a man about the pump. PANIC! When I called him he asked me if I were William C. Lathan. I said, I was William Jr. He then said, "Well, let me see. Are you the Reverend M. L. Lathan's Son or Grandson... you must be his Grandson because his son would be to old to be a college student." He went on to tell me that my Grandfather, Rev. M L. Lathan, had been the minister of the Presbyterian Church at Dandridge, Tennessee. I already knew this. But the rest was a wonderful addition to my life. He said, "Back in the 1930s your Grandfather was the minister of the (Presbyterian Church) in Dandridge and times were tuff back then. Forget about the pump! It is the least this church can do. Half the time the church didn't pay the man, though we said we would. He had to take a teaching job along with his ministry in order to keep himself and his family fed." And he added, "For the record, your Grandfather was the finest man I've known." No one could have a better epitaph. Sources: Records of the Presbyterian Church, records held by William C. Lathan, Sr. (now held by William C. Lathan, Jr.) and personal recollections of William C. Lathan, Jr.